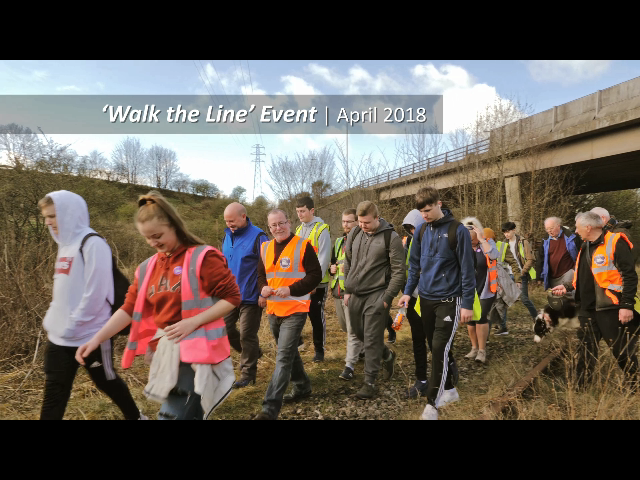 On April 23rd the Levenmouth Rail campaign invited pupils from the local schools and college to mark Scotland’s ‘Year of Young people 2018’ to “Walk the Line”. They were accompanied by a wide range of local politicians including MP’s, MSP’s and Fife Councillors. Everyone gathered to walk the 2.6 miles of abandoned track from Cameron Bridge to the rear of the Levenmouth Swimming pool and sports centre. The aim was to bring the local community together to promote the campaign for the Thornton-Leven rail link to be reinstated. With students joining us from Fife College, Levenmouth Academy and children from Balcurvie and St. Agatha’s Primary Schools we were able to hear the thoughts of the young people. As well as that of local politicians who are all in favour of reinstating the railway line. “It’s great to see so many young people here. The whole point of reinstating the line is to help current and future generations of young people to access education and work opportunities outwith our local area. Campaigners stress that at the moment transport links between Levenmouth and elsewhere are poor with lengthy bus journey times. A low car ownership rate in the area also means local people are denied access to many job opportunities and services. Access to a local rail rink will certainly benefit the younger generations’ and the wider community’s. With access to Universities and employment opportunities throughout Scotland, this allows them to potentially commute rather than completely relocate. It also will benefit children of a primary school age with access to greater learning opportunities through school trip and family excursions.